The latest ski hire gear, mt buller snow reports, chain reports and weather. A Mount Buller Post Office opened on 17 February 1958. Before 1984 Mount Buller was serviced by two lift companies that involved the skier needing to purchase two lift tickets to ski the whole mountain. In 1985, the two lift companies merged, allowing skiers to ski the whole mountain with one ticket. Today, Mount Buller is serviced by 22 lifts covering a wide range of terrain. In 1993, with an increasing number of visitors, the ski resort built a new quad chairlift called Wombat Lift on the skiers right of Little Buller spur to relieve the traffic on Federation triple chairlift. 2005 saw the addition of the Emirates quad chairlift to the lift network. A new six-seater chairlift — the Holden Express — was installed over the 2007/08 summer and is operational for 2008. This addition saw the decommissioning of one of the oldest chairs of the mountain — the Abom (previously known as Helicopter), along with Blue Bullet 2. 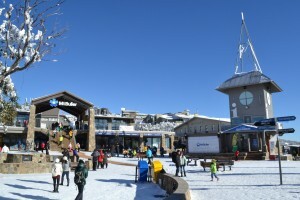 Now Mt Buller has become a bustling tourist attraction, marketed as Victoria’s premier skiing resort. The nearby town of Mansfield now relies heavily on the winter tourism to support a number of local industries including hospitality, accommodation and ski hire in Mansfield. The town has around 7000 beds available in accommodation facilities, the most of any Victorian ski resort. La Trobe University had a minor campus at Mount Buller. The campus facilities included a public cinema, gym and indoor sporting facilities. La Trobe has vacated the mountain, however the Resort Management Board is now using the building, better known as the Mount Buller Community Centre, as its home. All facilities are still operational, with the cinema, gym and sports hall open all year round. Mount Buller is also the home of the National Alpine Museum. The ski area around the town has a network of 22 lifts, capable of moving more than 40,000 people per hour – the highest capacity in Victoria. The highest lifted point is 1780 m at Grimus Chairlift and the base altitude is 1375 m at the Chalet Creek loading station on the Horse Hill chairlift / gondola. The lifts are owned by Groset, a part of the Grollo group of companies. Terrain: Beginner 20%, intermediate 45%, advanced 35%.